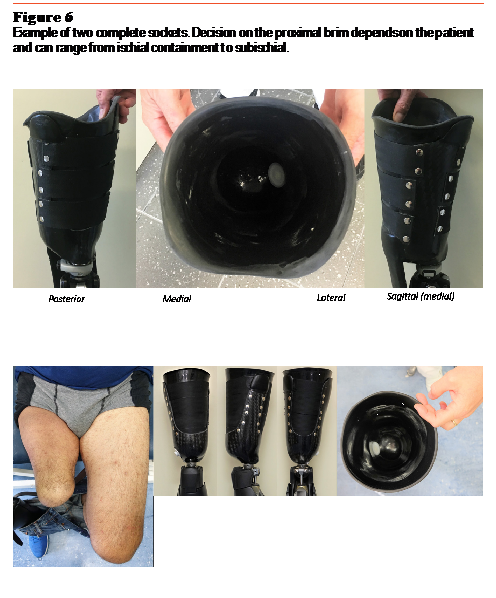 The socket is the most important part of a prosthesis.1,2 If the fitting is poor,3 the patient will experience skin breakdown as well as decreased mobility and independence, and will report dissatisfaction and lower perceived quality of life. The negative effects will extend to the service provider in terms of decreased efficiency, chance of reimbursement, and reputation. The limited availability of hydrostatic casting technologies for transfemoral amputees has been a constraining factor for the deployment of this approach beyond case studies.5 However, in early 2017 we were presented the first version of a commercial solution named Symphonie Aqua System Transfemoral (Romedis, D), which allows the casting of patients while weight bearing on the affected side. With this clinical study we wanted to establish: 1) if the casting procedure was well received by patients, 2) the typical level of pressure applied during casting, 3) the number of casts needed per patient to obtain a successful fitting, 4) if the rectification was simple and consistent among prosthetists, and 5) if the socket based on hydrostatic casting was included in the final prostheses. The Symphonie Aqua System used for this study consists of a metallic cylinder (19-inch height, 12-inch diameter) containing a silicone membrane. Between the two, it is possible to intake and outtake water, up to a desired and measurable pressure. A Venturi pump, sitting between the water supply/drain and the cylinder, ensures and accelerates this process (Figure 1). The system is positioned on a height-adjustable lifter. Since residual limb length varies among patients, the internal height of the system can be adjusted with a set of plastic rings and a distal cup. To better fit the residual limb diameter and medialize the patient during casting, a set of half-moon-shaped silicone adapters also is provided with the system (Figure 2). 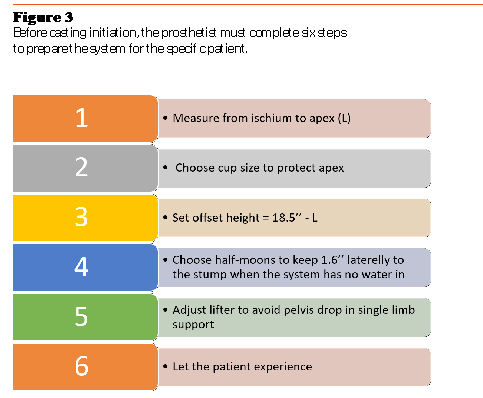 Before casting, the prosthetists must complete the steps summarized in Figure 3. To take the cast, the residual limb was first wrapped with wet plaster bandages. Immediately after, the patient inserted the residual limb inside the cylinder and the silicone membrane inflated with water. During water intake, the patient progressively shifted body weight onto the amputated side, until the membrane sustained the patient in full weight bearing (Figure 4). For this study, the water intake was stopped when the patient started to rise, which typically happened when the brim of the membrane was about 1.5 inches in height. The patient was asked to remain in this position until the plaster hardened, and then the water was pumped out of the cylinder. Finally, the patient removed the residual limb from the cylinder and the prosthetist removed the negative plaster wrap from the residual limb. INAIL) for socket review. Patients with no tolerance for compression, who had invaginated scars, or who had a flexed stump exceeding 15 degrees were excluded. Four prosthetists also were involved in the study. All prosthetists were specialists in transfemoral casting, with more than 15 years of experience. Their workshop within the Prosthetic Center completes about 800 above-knee fittings per year. In addition, one CAD/CAM technician with experience with MeshLab and Blender software participated. As outcome parameters, for each patient we noted: 1) the patient’s acceptance of the casting procedure, 2) the pressure applied to the residual limb while casting, 3) the number of casts needed to reach a satisfactory fit as perceived by both the patient and prosthetist, and 4), the number of successful deliveries of completed prostheses. 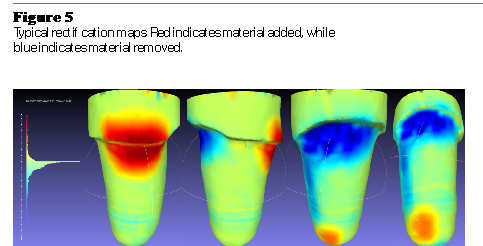 Moreover, the rectifications applied by the prosthetists were analyzed by scanning the positive plaster before and after rectification, through a M4D Scanner (Rodin). Quantitative rectification maps were calculated in MeshLab similar to Fatone et al.8 The rectification maps were qualitatively compared, and a CAD procedure was established by agreement among the prosthetists. Sixty-four transfemoral patients (46 ± 13 years old) participated. Fifty-two patients had a medium length residual limb, five short, four long, and three had a knee disarticulation. Fifty-two patients used a Seal-in liner (Össur, IS). For knee disarticulation and short residual limbs, we used Alps liners: Extreme liner AKFR and AKDT (with pink lock), respectively. For half of the patients, the etiology of amputation was traumatic. The procedure was deemed acceptable by all patients. The pressure applied was similar among patients, with an average of 0.22 bar (± 0.046). For 59 out of 64 patients (92 percent), one cast was sufficient to achieve a satisfactory fitting socket. Four patients were cast twice and one was cast three times to achieve a satisfactory fitting socket. Sixty-two patients (97 percent) have, to date, received the final prosthesis with no issues experienced over a follow-up period of eight to 12 months. Rectifications were minimal (typically smaller than 0.55 inches), focusing on the medial and posterolateral sides. Figure 5 reports the typical rectification map, obtained based on agreement among prosthetists. Two finished sockets are shown in Figure 6. A flexible inner socket is contained within a mediolateral carbon-fiber frame. It is important to note that the Symphonie Aqua System per se does not constrain the shape of the proximal brim. Depending on the physical characteristics of the patient, it is possible to deliver what we might call an ischial-containment-like socket, as well as a subischial socket. Patients were satisfied with the procedure, although it was more challenging for patients with a flexed residual limb due to the inability (at that time) to control the tilt angle of the lifter. The number of re-casts was minimal, and any nondeliveries at the time of writing were due to external factors other than casting. The analysis of the rectification maps was helpful for the prosthetists to quantify their inter-operator reliability and confirmed that rectifications were minimal. Importantly, the Symphonie Aqua System does not constrain the design of the proximal brim, which can range from ischial-containment to subischial. These results suggest that the hydrostatic system applied in this study is a viable way to support prosthetists in completing successful fittings of transfemoral patients. Results will need to be confirmed with standardized longer-term follow-up. As a final remark, in May 2018 Romedis released the Romedis Sym-phonie Aqua System TF to the public. Since our testing was completed, changes have been made to the system to improve the comfort for patients on their medial side; the size of the cylinder has been reduced, and the half-moon silicone adapters have been eliminated. The new system is already in use at INAIL, and another 70 patients have used the system to date. Exploration of this new system will be the object of a further assessment. Andrea G. Cutti, PhD; Giovanni Osti; Gian Luca Migliore; Dimitri Cardin; Fabio Venturoli; and Gennaro Verni are affiliated with the Prosthetic Center of the Italian Workers’ Compensation Authority (Centro Protesi INAIL) in Vigorso di Budrio, Italy. Legro MW, Reiber G, del Aguila M, Ajax MJ, Boone DA, Larsen JA, Smith DG, Sangeorzan B. Issues of Importance Reported by Persons With Lower-Limb Amputations and Prostheses. J Rehabil Res Dev. 1999; 36(3):155-63. PubMed PMID: 10659798. Geil MD. Consistency and Accuracy of Measurement of Lower-Limb Amputee Anthropometrics. J Rehabil Res Dev. 2005; 42(2):131-40. Kahle JT, Klenow TD, Highsmith MJ. Comparative Effectiveness of an Adjustable Transfemoral Prosthetic Interface Accommodating Volume Fluctuation: Case Study. Technol Innov. 2016; 18(2-3):175-183. Muller DM. Transfemoral Amputation: Prosthetic Management. In Atlas of Amputation and Limb Deficiencies, Vol. 2, 4th Ed., AAOS. Buis A, Kamyab M, Hillman S, Murray K, McGarry A. A Preliminary Evaluation of a Hydro-Cast Transfemoral Socket, a Proof of Concept. Pro Ort Open J. 2017; 1:7. Kristinsson O. The ICEROSS Concept: A Discussion of a Philosophy. Prosthet Orthot Int. 1993; 17(1):49-55. PubMed PMID: 8337100. Klasson B. Prosthetic Socket Fit Implications of Basic Engineering Principles. Advanced Prosthetic Science. University of Strathclyde Glasgow. 2006; 56. 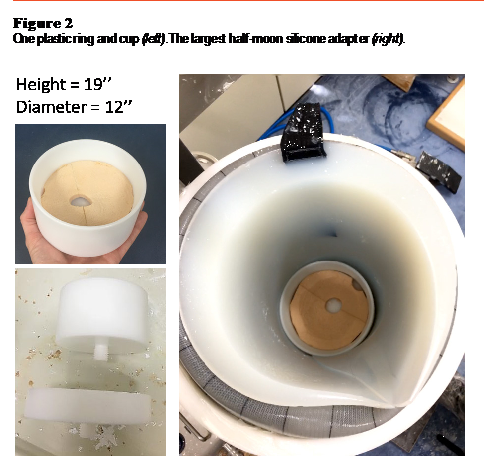 Fatone S, Johnson WB, Tran L, Tucker K, Mowrer C, Caldwell R. Quantification of Rectifications for the Northwestern University Flexible Subischial Vacuum Socket. Prosthet Orthot Int. 2017; 41(3):251-257.